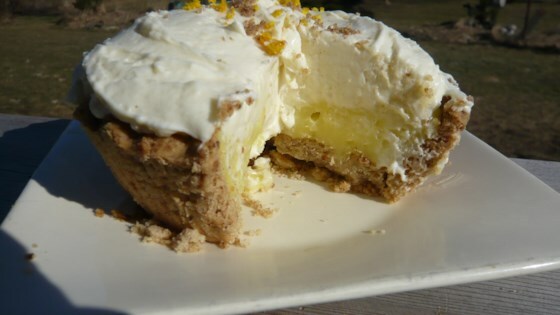 "The flavors of tart lemon, rich cream cheese, and buttery, nutty pastry mingle in this delicious dessert the whole family will love. Easy 3-steps to prepare. You can even experiment with different pudding flavors if you like! Choose any nut you like to add to crust." In a medium bowl, mix together flour, softened butter, and 3/4 cup chopped nuts until a soft dough forms. Press dough into bottom and sides of a 9 inch deep-dish pie pan. Bake in preheated oven for 30 minutes. Allow to cool completely. In a medium mixing bowl, beat together softened cream cheese and confectioners' sugar until fluffy. Fold in 1 1/2 cups nondairy whipped topping. Spread mixture into cooled crust. In a medium bowl, whisk together pudding mix and cold milk until smooth. Allow to set up 5 minutes, then spread over cream cheese layer. Top with remaining whipped topping and sprinkle with remaining nuts. Refrigerate at least 2 hours before serving. The title of this recipe says it all. Fantastic! So very tasty! Used a pre-made graham cracker crust, and tried banana pudding. Definitely will make again. I fixed this for our family Fourth of July picnic. It was a hit with everyone! Wow!how easy and how great it tasted. Amazing! The crust is delightful. This dessert disappears in minutes!